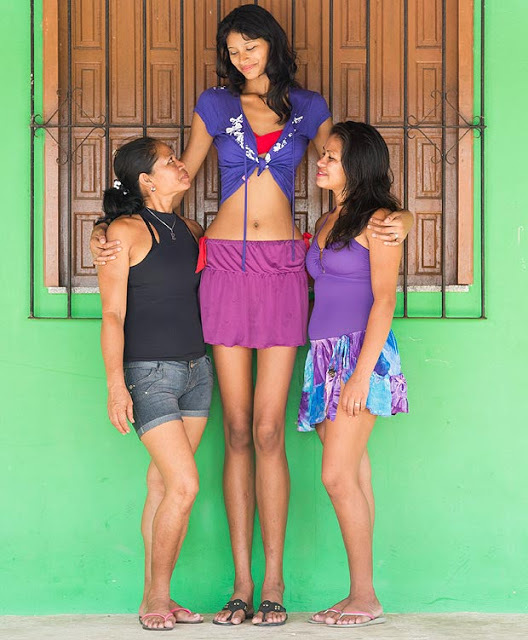 It is difficult to believe that Elisany da Cruz Silva, is just 17, and she holds the record of the world’s tallest teen girl at 6ft 8in. But if you think that will make the boys feel intimidated by her height you got it wrong because Elisany is in a relationship with Francinaldo da Silva Carvalho, 22, who stands at 5ft 4in…. And such love comes with a high price – he has to practically stand on his toes and crane his neck to get a kiss. Elisany, an aspiring model from Salinopolis, Brazil, is just an inch taller than Stoke City’s Peter Crouch — she has a form of gigantism due to a tumour on her pituitary gland. She grew faster than her seven siblings from the age of 11 and hit 6ft 9in when she was 14. But her sudden growth caused pain in her limbs and joints. Surgeons removed the gland two years ago and she shrank by an inch — but she could still not fit on the school bus and had to quit school due to teasing. But she’s happy now with Francinaldo. She said: “What really attracted me was his personality, the way he acts with people and the way he acts with me.